Temple University Libraries’ subject specialists create guides to library resources for general subjects as well as for specific courses and assignments. Faculty should contact Subject Specialists to get more information on these. Here are the Subject Guides that are currently available. Blackboard is a great place to make these guides available to students. View the Screencast below to see how easy it is to embed a library guide into your Blackboard course. For more information, see Integrating the Library Into Blackboard. We have just added a new service to TUlink. The Find Articles by Citation form allows you to enter an article citation (or part of a citation) and let TUlink find the full-text for you. As long as you enter at least a Journal Title, ISSN, DOI, or PMID, TUlink will try to get you a link. In many cases you will get a direct link to the full-text labeled “Article”. 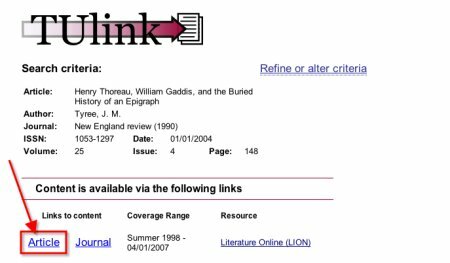 In some cases, the best TUlink can do is get you a “Journal” link that will take you to our electronic access to the journal where your citation is found. 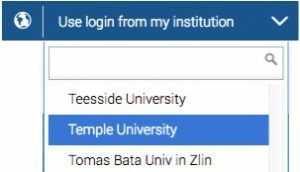 If Temple holds the journal in question in paper, you will get a link, and if TUlink cannot find any results it will direct you to an interlibrary loan form where you can request your article. In conjunction with this new addition we have slightly altered the “Find Articles” section of our library home page. We have added Find Articles “by Citation” to the list. Also, as part of this alteration, the list of “Only Full-Text” databases has been removed. The reasons for this are two fold: a) with the addition of TUlink, even if a database doesn’t have full-text in it, full-text access is a few clicks away through the “Find Full-Text’ icon; b) the full-text database list has gotten so long that it is no longer the small, useful subset of resources it once was. Have you encountered frustration in fetching the full text of an article when using the library’s research databases? We have some good news for you. We are pleased to announce the arrival of TUlink, a new service of the Temple University Libraries. With TUlink, the research process is greatly streamlined. TUlink acts as a bridge between a citation in a database and the full-text of the article in a different database–removing a number of formerly necessary steps. Clicking on this icon will perform a search of our full-text resources and when possible give you an “Article” link directly to the full-text of the article. In other cases you will see a “Journal” link to the electronic copy of the journal in which your citation was published. TUlink can also get you to information on journals held in the library on paper. If no full-text is available you will be offered an interlibrary loan link to request the article from another library. TUlink is a work in progress. Currently enabled databases include all the EBSCO databases (Academic Search Premier, ERIC, MLA, PsycInfo, etc) and CSA databases (Criminal Justice Abstracts, Sociological Abstracts, etc) and numerous others. Other databases will be enabled on an ongoing basis. See more details on using TUlink. Whether you call it Diamond, the library catalog or that web-thing that lets you look up the library’s books, be prepared for a new experience. On April 12, 2007, the Temple University Libaries will be offering a public preview for Temple faculty and students of an entirely new version of its library catalog – the one we call Diamond. Here are some of the brilliant features of the new Diamond: * A less crowded interface replaces the current tabular-looking screen (see the image below). The new version makes use of horizontal tabs to better display the available search options (e.g., author, title, etc. ), and each search screen has improved search examples embedded. * Where this new Diamond really shines is the way it delivers and displays results. Working much like familiar search engines, the results are retrieved and ranked according to their relevance to the search. Default results are grouped into categories such as “highly relevant”, “very relevant” and “relevant” as indicators of degree of relevancy to the search topic. * It offers searcher customization. If you prefer to see your results by date with the latest book displayed first, click the “date” link to get the results to display as they do in the current version of Diamond. Features for modifying searches and applying a variety of limits are clearly displayed with new icons. We have also improved the content of each entry to eliminate confusing abbreviations. *Searchers can view more content per page. The record results display is expanded to 50 items from the current limit of 12 per page. During the preview period the current and new version of Diamond will run simultaneously. Users can choose either one, and make comparisons between the two interfaces. We are seeking your feedback on our new version of Diamond to help us fine tune the interface before we permanently migrate to this new version in early summer. Please use the links to our feedback form to share your thoughts with us. 1) When you’re ready to export the records from Diamond, you should select “End-Note/RefWorks” as the format from the list at the left. 3) Click “Submit” and save the file to an easily accessible location. 5) From the “References” menu at the left of the RefWorks menu bar, select “Import”. 6) Select “EndNote View” as the “Import Filter/Data Source” and the “Database”. 8) Under “Import Data from the Following Text File” click on “Browse” and then find the file you just exported (probably called “export.txt”) and click “OK”. 9) Click “Import” at the bottom. 10) Your records should then be imported. You can view them by clicking on the “Recently Imported” folder link. If you have any question, ask.